I see that we have written nothing since June to indicate progress… Well that’s partly holidays, partly a dose of shingles, and partly because I have been more focussed on building than writing (no bad thing I guess). Well we girded our loins and bank balance and ordered the kilometer of Western Red Cedar required for planking of the boat. We ordered this from Barry Biddlecombe at cedarstrip.co.uk . Barry has been very helpful and supportive in the process, and his prices are excellent (no connections, just a happy customer). I will take a picture of this pile of wood (a much smaller pile than you would imagine (a cuboid of about 0.5M square and 3m and 5m lengths))…. Louise and I are getting faster at fitting these to the boat, but it takes about 45mins per plank. We started by scarfing planks together to form 27ft lengths, but found that manhandling these lengths was really difficult, so we are now fitting them in two halves, and staggering the joints. Again using advice from SBA members (Mike Bell and Nigel Thompson) and Barry from Cedarstrip and a lot of reading Dave Gerr’s book on scantlings I decided to reduce the cross section of the strips (and increase the thickness of the cladding). We reduced them to 18mm by 33mm (against 22mm by 33mm as specified in Selway’s plans) – the intent was to make the planks easier to fit (as producing compound bends needed in a sample 22×33 strip seemed close to “impossible” for me). We also deploy some clamps to help twist the planks – these are clamped to the plank so that the long end of the clamp lies inboard, and then use some string/rope to put the twist on the plank. Here are some more pictures of the process… (we are now in a rush to try to fit all the planks before the weather turns too cold/wet for epoxy work)…. looking forward – it’s starting to look “boaty”! looking aft – see the kink? You might recall we had some concerns over the strength of the glue when it was “gap-filling” so we have decided to mix epoxy and glue approaches (not together you understand 🙂 ) in the construction. As we already decided to fit each plank in two parts (bow and stern) to make it easier to handle, and because the level of “twist” required in the planks is much less in the stern (due to the simpler lines of the hull there); and because the planks sit naturally better where there is less twist, we have decided to use glue (Titebond) on the stern planks and use epoxy (West System) on the bow planks (where there is a greater risk of inter-plank gaps that need filling). This entry was posted in Hull Build and tagged epoxy, hull build, planking, Steam Boat Association, strip planking on September 3, 2014 by sybefur. Well, epoxy will certainly be strong enough. The downside will be when you come to fair things up since it will be harder to sand than the cedar. This can make it hard to get the faired shape, eg the cedar will tend to sand away too fast. I didn’t have any trouble with planks trying to come free after gluing. They mostly had a nail though them into a block beside each temporary frame, and sometimes a clamp as well. The nails were though a scrap piece of timber to spread the load and avoid marking. You do get a hole through the plank but this will be covered up with glass later anyway. Using a scrap piece to nail though means you can hammer the nail fully home and still get it out afterwards. We were typically putting on three planks in an evening. That would be with all the preparation already done, eg planks spliced to length and cleaned up beforehand. We started at the sheer line and worked up, and from the keel and worked down, only one new plank at a time at each place. I think the reason for doing three was that we used the box tape and when you do a plank along one side of the keel and boxtape around the whole of the planking there, you can’t then add another plank on the other side of the keel. But three would have been plenty for the time and energy available too. I’d be happy to build another boat, provided someone else was going to do all the sanding! Yes I am sure you are right – I might live to regret the decision! The “coming loose” was because I unclamped too soon – but what caused me to change my mind was the pool of un-set glue, because it showed I was failing to close the gap between the planks tight enough to work with a non-gap-filling glue… I can manage two planks in a day (4-half planks, as I don’t scarf them off the boat) working single handed.. I have found I don’t need many screws to hold the planks to the moulds, providing I get the twist right – initially I screwed at every mould on every plank with a “penny washer” to spread the load, but found as my “feel for it” improves I might only need 1 or 2 screws every couple of planks (apart from the ones at stem and stern)… When are you expecting to reach the water John? With the relatively long and narrow shape of my own hull, the hardest planks to fit were those near the keel, since they are nearly vertical at bow and stern and twist to the V angle of the hull near the middle. I glued all of my planks to the full length before fitting to avoid having to do joins in mid air on the hull. They were glued to stem and stern with epoxy but I used Gorillla glue (foaming polyurethane) for the edge joints. When fitting them onto the hull, herself used a couple of different slotted levers to pull them down, one with a plank sized slot in the end and another with the slot in the side. Depending on the location, these can help provide the twisting force and also help to push the plank against the last one. Apart from clamps, you can also use cheap box tape to pull the plank against the last one, just go round and round the existing planks. You can get a surprising clamping force like this. You go through a lot of tape of course, but the stuff is cheap enough. It stops being possible once you start closing the gap up. But anyway, good to see you are making progress. 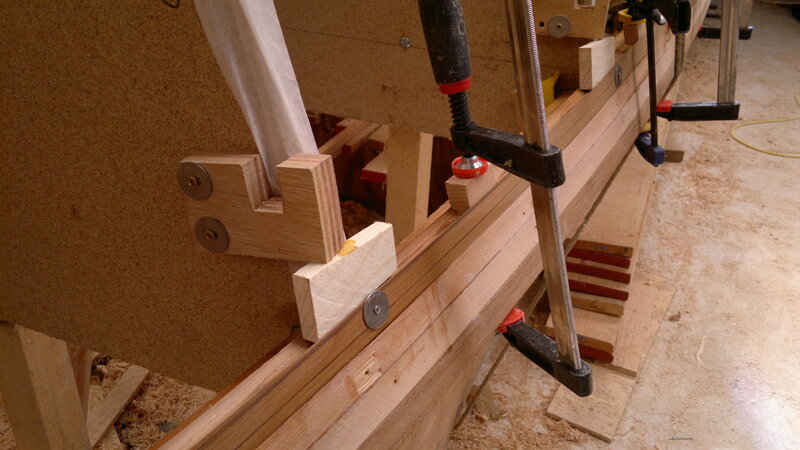 We are getting quite skilled at the twisting of planks… as you can see in a later post we are using the “F”-clamps as a substitute for the slotted levers (I found the levers I made had a tendency to damage the edges of the plank I was fitting, and the clamps with plastic jaws overcome this problem.